As of July 2018, there are a total of 1,092 World Heritage Sites located in 167 States Parties (countries that have adhered to the World Heritage Convention), of which 845 are cultural, 209 are natural and 38 are mixed properties. The countries have been divided by the World Heritage Committee into five geographic zones: Africa, Arab States, Asia and the Pacific, Europe and North America, and Latin America and the Caribbean. The country with the largest number of sites (including sites shared with other countries) is Italy, with 54 entries. The country with the largest number of sites by itself alone (excluding sites shared with other countries) is China, with 53 entries. ^ Centre, UNESCO World Heritage. "Italy - UNESCO World Heritage Centre". whc.unesco.org. Retrieved 2018-07-02. ^ Centre, UNESCO World Heritage. "China - UNESCO World Heritage Centre". whc.unesco.org. Retrieved 2018-07-02. ^ Centre, UNESCO World Heritage. 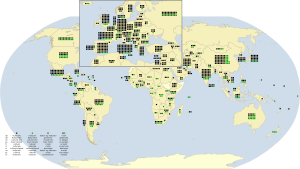 "UNESCO World Heritage Centre - World Heritage List (transboundary)". whc.unesco.org. Retrieved 2018-07-03. ^ "CLT-82/CH/CONF.015/8 - Report of the 1st Extraordinary Session of the Committee". UNESCO. Retrieved 23 October 2013. ^ "CC-81/CONF. 008/2 Rev. - Justification for inscription on the List of World Heritage in Danger, 1982: Report of the 6th Session of the Committee". UNESCO. Retrieved 23 October 2013. ^ Centre, UNESCO World Heritage. "Poland - UNESCO World Heritage Centre". whc.unesco.org. Retrieved 29 September 2017.